I work with all ages including young kids, teens, and adults. My students gain increased confidence in their musical ability as well as in other areas of life. Students have multiple performance opportunities throughout the year to hone their skills. My teaching methods allow students to learn how to read music quickly. My lessons involve music games and other activities to keep students engaged and having fun. My students develop a strong musicianship foundation, providing them the tools to advance their music professions if they choose to. I give my students the tools and confidence they need to enter into the musical world and THRIVE. Enrollment is limited - call today! In order to give my students a top-notch education and offer the opportunities that I do, I do not carry a large student roster. I offer 12 lesson, 24 lesson, and 36 lesson packages. I have packages for both 30-minute, 45-minute, 60-minute and 90-minute lessons. 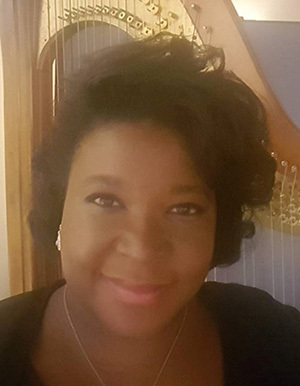 Candace is a native to Philadelphia where she began piano at seven, after seven happy years of piano, she also began Harp with Mary Anne Coppa at the prestigious Settlement Music School. After Mrs. Coppa retirement she went on to study with world-renowned Harpist Anne Sullivan. After Graduating from Philadelphia High School for the Creative and Performing Arts Candace attended Arcadia University pursuing an Individualized Major of Music Performance and Special Education. In her Junior year, Candace started Lark Music. Candace teaching experience spans over 26 years. Candace teaches adults, children and welcomes students with special needs. Although Candace has created a high standard of performance, she believes each student learns differently and always meets students where they are. Candaces leaves by the motto Music For All And All For Music. Candace is also The Happy Musician Blogger. The purpose of the blog is to give musicians advice and guidance on keeping happiness in their art. 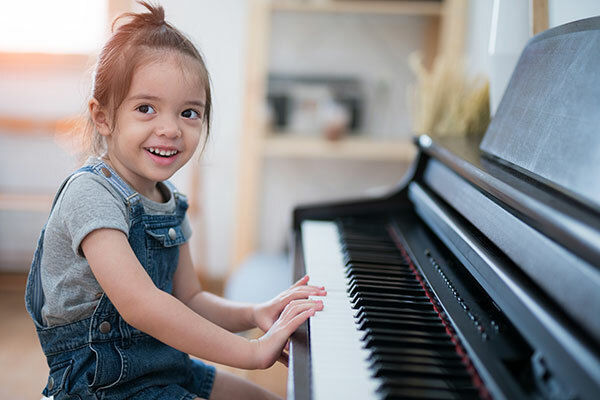 During the summer you can find Candace coaching and mentoring students with Anne Sullivan and teaching fun music workshops. She has performed with many orchestras, including the Lansdown Symphony, and the Black Pearl Chamber Orchestra. She has graced the stages of The Academy Of Music and The Kimmel Center and the Wilma Theater. She is a sought-after musician in the tri-state area, performing regularly with various jazz and classical ensembles. She is currently the Harpist with the Ever Ensemble, performing a fusion of classical, traditional international music with a modern twist. Look for the Ever Ensemble on WHYY in 2019. “Candace is a talented, kind woman who has a great rapport with children (as well as their parents). My daughter, who recently graduated high school, took harp lessons with Candace for five years. While my daughter took to the harp immediately, it was a little daunting for my husband and I to know how to help her care for such a complex, beautiful instrument. Candace is a huge help in this area as well--she made recommendations from where to buy strings to having a harp regulator come to her house for everyone's harp. Not only did our daughter have a wonderful music teacher, she made a very nice friend!" 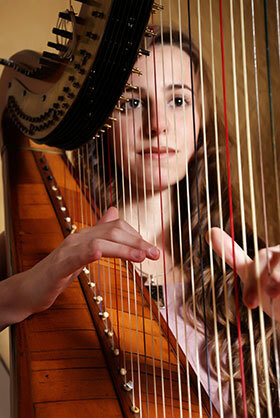 “My two youngest daughters take Harp and Piano with Candace at Lark Music, going on about two years now and their experiences have been amazing. They've gotten a lot of exposure and they love playing the Harp and Piano with Mrs. Candace." Email me at larkmusicstudio@gmail.com or complete the form below for more details about my lessons or to reserve a time. Cancellation Policy: I require 24 hours notice (if possible) if you need to cancel a lessons and 2 weeks notice if you would like to cancel permanently. Under 16 Policy: All students under 16 must be accompanied by a parent and the parent must stay for the entire lesson.